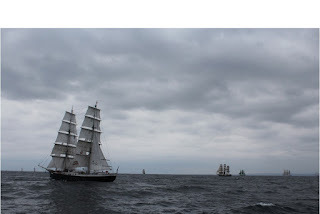 The ship had been preparing for this race for last couple of months and the succeeding paragraphs innumerate the events from 28-30 Jul 15 during and after the race. 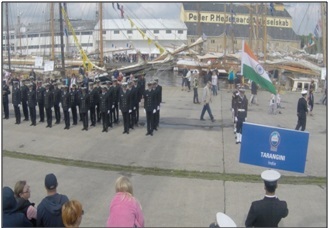 The Sail Parade commenced at 1200 hr local time after the ships were lined up in the promulgated formation. 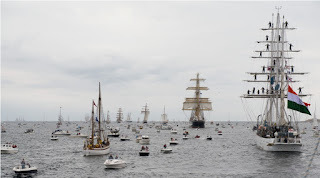 Sail Parade was an evolution where 86 tall ships were required to sail together in a designated formation at a distance of 01C from each other and a speed of 5 knots. 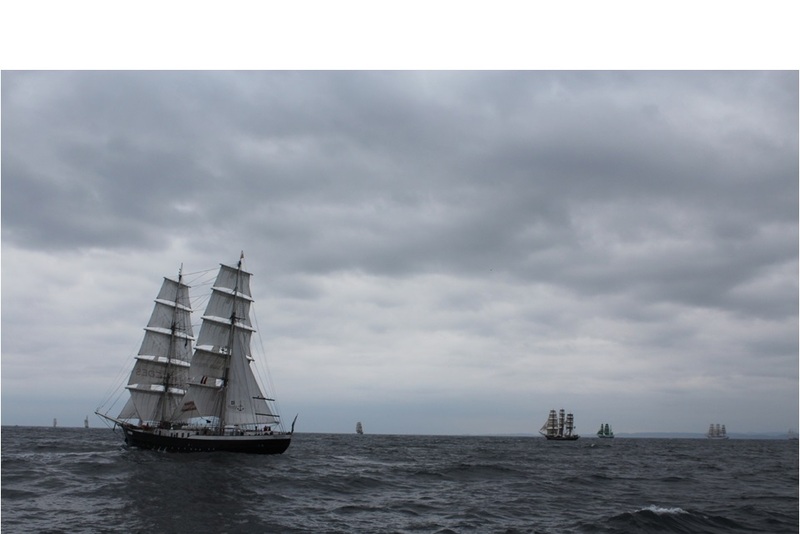 In the sail parade the ship covered a distance of 12NM. Maneuvering during the Sail Parade was tricky as hundreds of boats owned by locals continued to pass the ship at 10 meters or less. 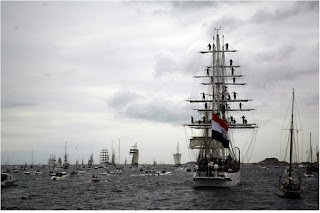 On completion of the Parade of Sails the ship started preparations for the race. These included removing the dressing lines, ungasketing and setting sails. A two watch organization for the race and an SSD organization for the Race Start had been formulated. The winds were from WNW the start line was oriented 000-180 by the Race Control, which was operating from Norwegian Coast Guard Ship Svalbaard. The ship thus proceeded to a position East of the Start Line, to enable a starboard tack, broad reach start. To facility adequate maneuvering space and no close quarter situations a Start Gate of 20 minutes was promulgated for Class A ships. The ships were thus required to start anywhere between 1800 to 1820 hr local time and their time of crossing the start line would be counted for final calculations. As the winds were from the quarter it was decided to start at the back of the fleet and them build up during the race. The starts for Classes B, C and D were scheduled at intervals of 20 minutes thereafter. The ship thus started at 1817 hr local time. The winds being from stbd qtr ensured that the ship got better speeds than all those ahead of her and in close vicinity. By 2200 hr local time, the ship had gained gained 04 positions among Class A ships. 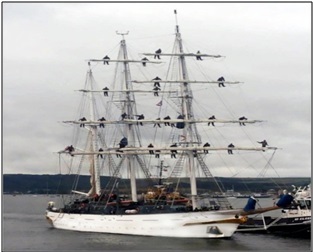 The sky was overcast and rainy throughout the night and the crew kept pushing her from one vessel to the other. The daybreak saw the ship rounding Waypoint 1. By then the ship had passed one-third of the fleet and some Class B, C and D ships had over taken us. As the vessels converged at waypoint 1 the winds died down to 3-4 knots and the weather forecast indicated nil to very low winds in the next 12 hours. 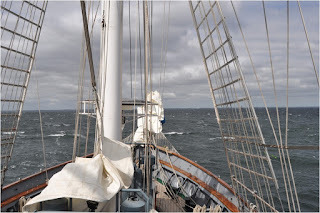 The ship had experienced a 1-1.5 knot easterly current on the way to Kristiansand in the same region, it was thus decided to go as south as possible without losing distance. This was done to ensure that the ship drifted past waypoint 2 with the current even if the winds reduced further. The distance of about 50 miles to waypoint 2 was covered in 24 hours. These 24 hours were packed with activity as lack of winds meant lack of steerage way. The crew worked tirelessly to benefit from ever gust of wind and to ensure that no close quarter situation slows the ship down. At daybreak on 30 Jul the ship overtook the Brazilian Naval STS Cisne Branco and rounded waypoint 2. At this point the winds had started increasing and the ship was now in the middle to the fleet. With another 65 Nm to waypoint 3 and 120 Nm to finish the prospects of finishing somewhere in the top of the fleet looked good. The call to go south after waypoint 1 had paid off, as many who didn’t, had missed waypoint 2 and had to come back to round the mark. At around 1000 hr local time the Race Control announced that the race was being called off at 1200 UTC view weather and the positions at 1200 hr would be noted to decide final positions. After the final position of the ship was passed to the Race Control a Gale warning was issued and ships were told to indicate ETA Aalborg. The ship thereafter sought permission to enter Aalborg on the 31 Jul 15, a day in advance. Wind speed increased gradually and by the evening of 30 Jul 15 ship was under sails with winds of 25- 30 knots. While the ship made her way to Aalborg most of the ships from neighboring countries entered ports along the way with most of them entering the port of Skagen in Denmark. The ship commenced entry into harbour at 1100h after embarking the pilot. The channel to reach the berth was 21NM in length. For the entry into Aalborg the ship was dressed over all and the ship side was manned by ship’s company. Due to 25-30 knots of head on winds the ship could average a speed of 5 knots while entering harbour and thus took 7 hours from pilot embarkation to alongside. The tugs available for berthing were not suitable and due to lack of space the ship had to make a stern board approach on to the 40 meter berth. With winds of upto 25 knots and a current of 2 knots, both from right astern the approach required some fine maneuvering to get alongside. A knock out football tournament for crew members of all the participating ships was held on 01 Aug 15. Ship’s football team finished runners up in the tournament. In an exhilarating and closely fought final, they lost to team from Brazilian Naval ship, Cisne Branco. On their way to the finals, the ship’s team had beaten teams from Netherlands, Germany and Ecuador. 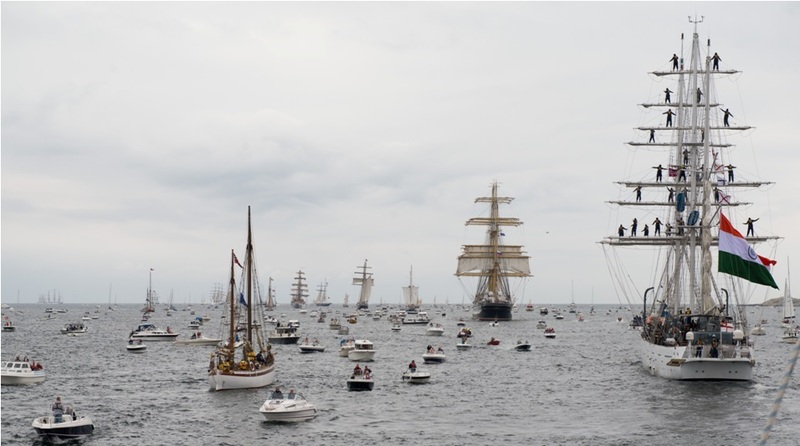 A Crew Parade of all the participating ships was held from Aalborg Central park to the Main stage in the port area. The ship paraded two contingents. A marching contingent of Officers and sea trainees and a contingent of ship’s company dressed in traditional wear representing different states of India. The crew of the ship had created a two minute continuity drill for the marching contingent. This drill was practiced at sea on passage to Kristiansand and then finally fine tuned on the jetty at Aalborg. 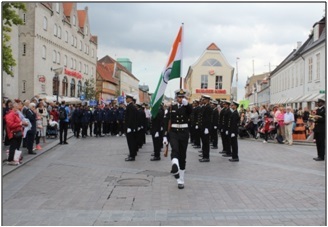 The ship’s marching contingent which was lead by the “Nishaan Toli” in full ceremonials, with the Bugler playing and the Sea Trainees singing along was a big hit with the spectators. Even the crew from other ships stopped during the parade to watch the drill. 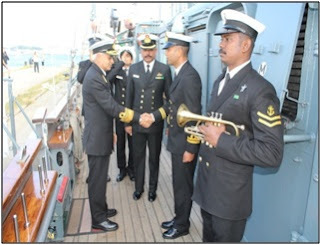 At 1000hrs on 03 Aug 15 Vice Admiral Sunil Lanba C-in-C Southern Naval Command visited the ship. Admiral had a walk around of the ship. Thereafter he addressed Sea Trainees and the crew of the ship. 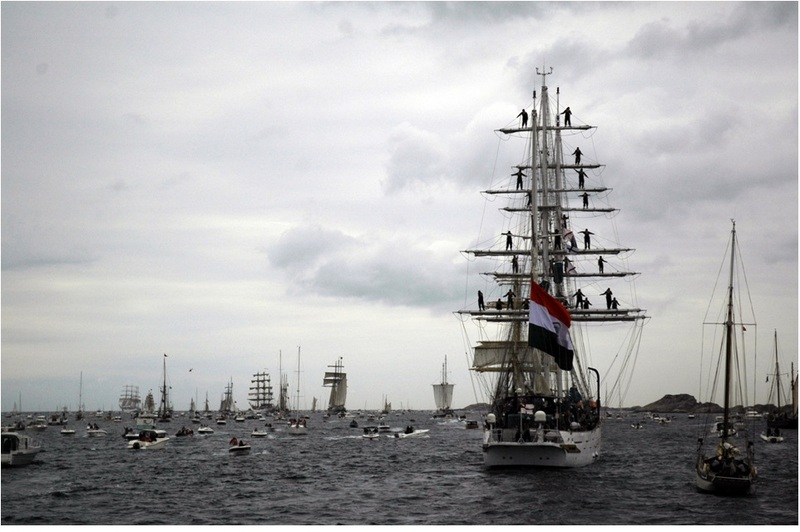 He congratulated the ship’s company for the voyage so far and wished the best for upcoming events. During the address he also shared his experiences at sea. On completion of the address he interacted with ship’s company and Sea Trainees. A reception was hosted onboard at 1900 hrs on 03 Aug 15 followed by dinner. The ship remained dressed overall for the occasion. 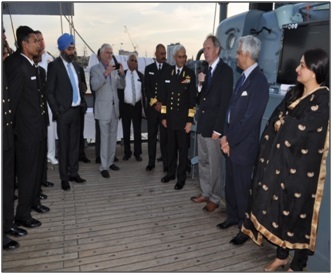 The reception was attended by C-in-C Southern Naval Command Vice Admiral Sunil Lanba, The Ambassador of Indian to the Denmark, The Mayor of Aalborg, Chairman and Members of the Sail Training International, DAs of other countries and captains of other Tall Ships. 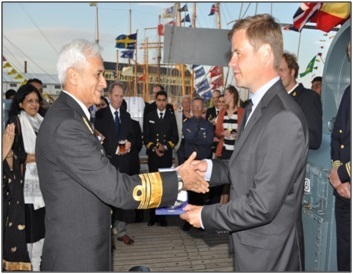 The Commanding Officer addressed the gathering and expressed his gratitude to the government and the Aalborg. After this he gave a small brief on the ship and this voyage, this was accompanied by slide show depicting various activities of the ship. The highlight of the evening was an impressive performance by the Sea Trainees and Mr Haakon from Sastraad Lehmkul, the Norwegian Sail Training Ship. The Trainees and Mr. Haakon a renowned singer had prepared a surprise for the gathering. 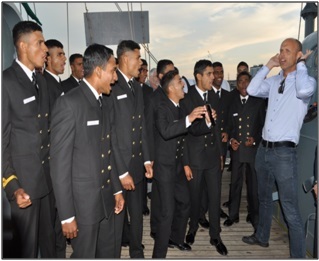 During the day Mr Haakon conducted a class on Shanty Singing for the trainees. This enthusiastic bunch thus gathered around and enthralled the audience with ‘Shantys”. To wrap up the evening the Captain welcomed the Commander in Chief to the Tall Ship Events in Aalborg. 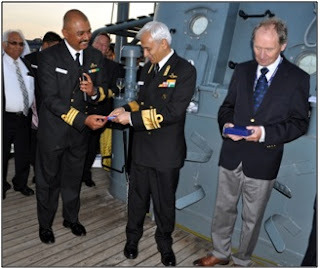 On a lighter note the C in C was presented a “Crew Wrist Band” as the crew of INS Tarangini. This Wrist Band gives access to all the rides, all music festivals, all crew parties, and some pubs in town. 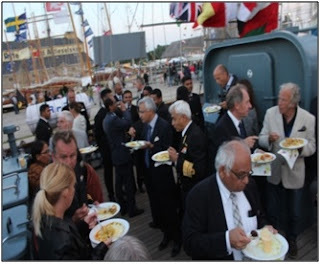 With all these freebees associated to it, the crew wrist band was probably the most valuable gift the crew could give to their C in C.
The guests were served Indian delicacies prepared by the ship’s cooks and some procured from a local Indian Restaurant. The crew has had the opportunity to sample the local Brew in every town that we have visited so far. So we the crew of Tarangini offered a toast with a popular Indian Dark Rum for the well being of those at sea. With captains of various tall ships attending the toast and the whole event including the Shanty’s turned out to be a spectacular success.